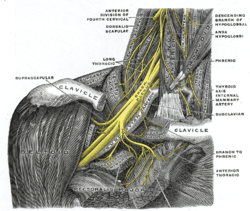 The suprascapular nerve arises from the upper trunk of the brachial plexus which is formed by the union of the ventral rami of the fifth and sixth cervical nerves. After branching from the upper trunk, the nerve passes across the posterior triangle of the neck parallel to the inferior belly of the omohyoid muscle and deep to the trapezius muscle. It then runs along the superior border of the scapula, passes through the suprascapular notch inferior to the superior transverse scapular ligament and enters the supraspinous fossa. It then passes beneath the supraspinatus, and curves around the lateral border of the spine of the scapula through spinogleniod notch to the infraspinous fossa. The suprascapular nerve is a mixed peripheral nerve containing motor and sensory components. In the supraspinous fossa it gives off two branches to the supraspinatus muscle and in the infraspinous fossa it gives off two branches to the infraspinatus muscle. Suprascapular paralysis, causing back pain, problems with abduction and external rotation of the humerus, and wasting away of supraspinatus and infraspinatus. ^ a b c d e Avery, BW; Pilon, FM; Barclay, JK (November 2002). "Anterior coracoscapular ligament and suprascapular nerve entrapment". Clinical anatomy (New York, N.Y.). 15 (6): 383–6. doi:10.1002/ca.10058. PMID 12373728.